The Forester Pole Saw has been designed to offer a product that sits neatly between the better known Zubat and Hayauchi Pole Saw ranges. Like the Zubat Pole Saw, it is a lightweight, state of the art, telescopic pole saw with an oval shaped aluminium alloy pole which offers both strength and precise control. 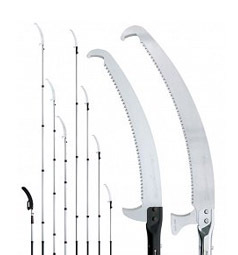 However, it offers a longer and stronger blade than the Zubat Pole Saw and with two extension poles, it can prune at greater heights. 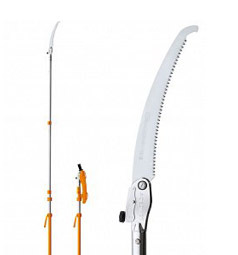 Overall it is lighter than the Hayauchi Pole Saw but offers a similar blade length. This is another very versatile product which can be used in a wide range of circumstances including trimming, pruning, gardening, forestry and arboriculture. The telescopic design has two locking systems – a spring loaded locking button and friction clamps which work in tandem to ensure a strong and stable pole extension. These lightweight pole saws can be used from the ground or climbed with to gain greater pruning range without the use of heavier, more cumbersome equipment. The bright red design makes them clearly visible while the extension poles are shorter than some other models making this compact telescopic pole saw easier to transport and store. Forester 3000 offering an extension range of 1.7 - 3.0m. Forester 4500 offering an extension range of 2.2 - 4.5m. The saw has a curved 380mm blade with a standard teeth ratio of 7.5 teeth per 30mm. 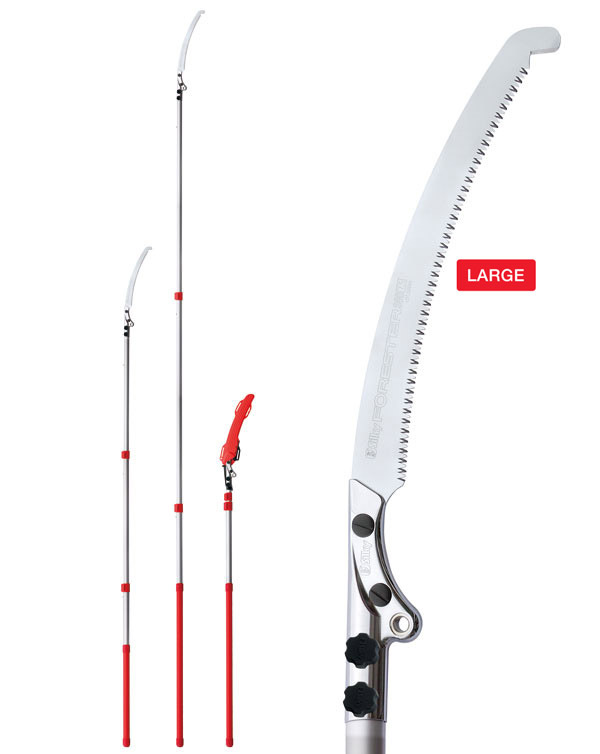 A red rigid-plastic blade guard is included, which locks onto the blade for extra protection. The base poles have pole-end shock absorbers and a comfortable rubberised over-grip which ensures good hold and control. Forester Pole Saw blades cannot be re-sharpened due to the use of electro-impulse hardening in the manufacturing process. Replacement blades are available as are all other parts. To extend the Forester Pole Saw, the clamps must be released and poles extended from the bottom up and closed from the top down. It is important that both locking systems are used to ensure the structural rigidity of the extended poles. Spring loaded locking buttons allow multiple length adjustment and safety friction clamps hold the extensions firmly in place. As with all Silky Saws, the cut is on the pull stroke which means the blade will be under tension and will not bow. Let the blade do the work for you. Never force the blade on the push stroke as you will be pushing against the direction of the teeth – if the blade becomes caught, do not push hard against it. Carefully take the pressure off the blade in order to release the saw. WARNING. DO NOT USE POLE SAWS WITHIN 15M OF POWER LINES OR ELECTRICAL WIRES. Failure to heed this warning may result in serious injury or death by electrocution. WARNING. NEVER CUT DIRECTLY ABOVE YOUR HEAD. Always consider where falling branches will land on the ground. We strongly recommend the use of protective hard hats and glasses when using pole saws. WARNING. Silky Saws are extremely sharp so please be careful when using and keep away from children. Improper use can cause serious injury. MANUFACTURER WARNING. Incorrect use of a Silky Saw may cause injury. Silky, its affiliates, subsidiaries, importers, distributors and dealers are not responsible for and shall not be liable for any fatality, injury, loss, or damage resulting from the use of its saws. 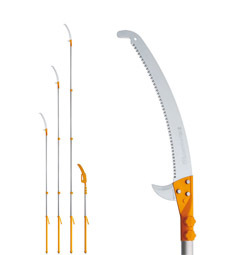 The Forester Pole Saw is telescopic and is constructed of aluminium alloy. They are lightweight and oval in shape which provides extra strength and rigidity and minimises bend when fully extended. This gives the user greater control over the direction of the blade when cutting. friction clamps - the secondary pole locking mechanism. 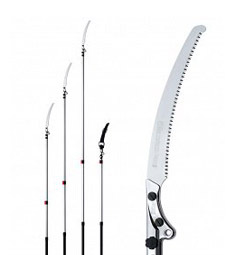 The Forester blade is manufactured from SK-4 carbon steel and cut out by laser. The taper-ground profile reduces drag and directs more usable energy to the cutting edge. In addition, the 'non-set' design teeth means they are formed inside the width of the blade – this reduces friction and enables a cleaner, faster and easier cut. Many other saws have teeth formed to project outside the width of the blade requiring much greater effort when sawing. There are four razor sharp cutting angles on the inside of each tooth. Silky call this 'Mirai-Me' and it enables the blade to cut smoothly through the branch, significantly reducing splintering and producing a very fine smooth cut. The super fine cut destroys up to 50% less wood cells allowing the tree to heal faster and reduces the risk of disease. The Forester Pole Saw blades are also chrome plated which helps protect against rust and sap as well as providing additional strength. This also helps extend the life of the blade.